You have a multitude of options before you when you are considering which exhaust system may represent the best choice for your Volkswagen Golf R. So, let’s narrow things down slightly by focusing, at least at first, on what are known as cat-back exhaust systems. The term ‘cat-back’ basically refers to the section of an exhaust system that runs from the ‘back’ of the ‘cat’ – or in other words, the outlet of the catalytic converter – to the exhaust tips. A cat-back exhaust system therefore tends to include the pipe from the converter to the muffler and tips. There are a number of reasons why someone may decide to invest in a cat-back exhaust system as an upgrade on their car’s standard exhaust arrangement. The chance to boost horsepower is certainly one of them, and, while a cat-back system is not the most obvious or primary source of more power, it can yield a small increase, given the removal of flow restrictions. 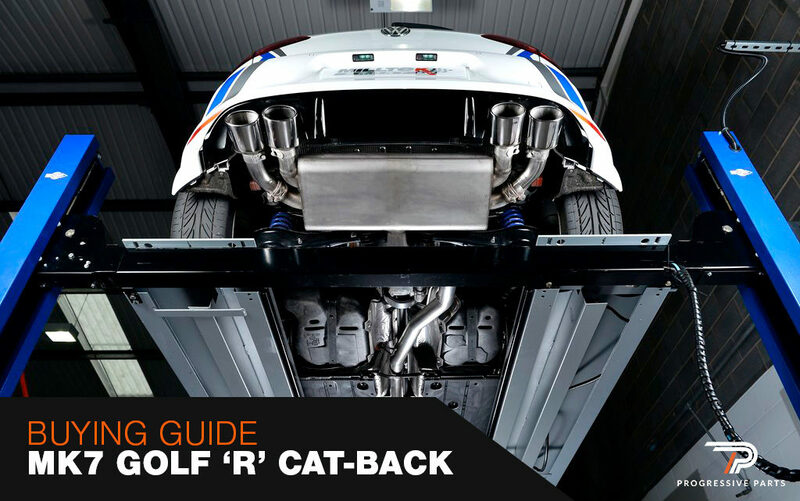 Other frequent benefits of fitting a cat-back system to a car include a more aggressive, high-performance engine tone, as often especially desired by the younger generation, and which can even be felt inside the vehicle, as well as – believe it or not – improved fuel economy. A cat-back system admittedly doesn’t make a massive difference to the amount of fuel the engine consumes while running, but it’s nonetheless another potential advantage to consider. What are the different types of cat-back systems you should consider? The various types of cat-back systems available can be split into the following options, with each being listed on our website separately. Resonated/non-resonated – this refers to whether or not the exhaust system has a central silencer or muffler in place. In all instances, it is a non-resonated system that will produce a louder and fiercer sound on a vehicle than an equivalent resonated one, due to its removal of a silencing part. Valved/non-valved – some cat-back systems have valves in the back-box pipes to enable the car to automatically become louder or quieter, depending on whether the driver has selected ‘eco’, ‘comfort’ or ‘sport’ mode on the car’s dashboard. Some of Scorpion’s systems actually reuse the car’s O.E. valves, but generally speaking, electronic valves will add considerably to a system’s price. Tips – these are available in different shapes and finishes, according to buyer preference. Polished silver or black ceramic styles are popular, although this naturally depends on the brand. Brand – this will always be an important factor in the process of selecting a cat-back exhaust system. Here at Progressive Parts, we are happy to able to recommend and supply the systems of an extensive range of trusted brands, such as Scorpion, Milltek, Remus and Cobra. So, which specific products would we point you towards? Our pick for a great cat-back exhaust system for a Volkswagen Golf R would be a non-resonated polished silver system, which still leaves you with plenty of options. The sound, for instance, is excellent with a stock downpipe, while the price will also be more competitive than the other possibilities. Such systems are also known for their awesome build quality, and fitting them in the workshop is a breeze – which isn’t something we can say for all of the alternatives, as much as we hate to ‘name and shame’. If you wish to save some cash, electronic valves aren’t strictly necessary, although this means you won’t benefit from a variable sound. Admirers of the Scorpion brand, for example, may find their attentions captured by the non-resonated cat-back systems we can offer for both the Mk7 and Mk7.5 facelift Golf R, and which both incorporate electronic valves and polished silver Daytona tips. Or perhaps you’re on a restricted budget? In that case, a Resonator Delete Pipe Kit from VAGSport could be the ideal cost-effective solution. This cheap modification creates the illusion of a nice sound from the car’s stock exhaust system, simply by removing a central silencer. The VAGSport Resonator Delete Pipe Kit is a great-selling product, which is unsurprising given its subtlety, that makes it a good choice for a vehicle that is under warranty; it also makes sense for those who simply don’t want to splash out too much on a full system. We also presently have highly rated Milltek cat-back exhaust systems in our stock, including this non-resonated option for the Mk7 Golf R with polished round tips, and this one for the Mk7.5 model that incorporates polished oval tips. Both of these systems look impressive but discreet, and are manufactured from 304 aircraft grade stainless steel. As aforementioned, we can also bring you acclaimed Remus and Cobra cat-back exhaust systems for your Golf R, including valved and non-resonated systems that can be depended on to enhance the sound, appearance and all-round quality of your vehicle. If you would appreciate further guidance as to which cat-back exhaust system could represent the best choice for your own Volkswagen Golf R, don’t hesitate to contact the Progressive Parts team directly. We are committed to continually sourcing the parts that will enable you to get so much more out of your vehicle in 2019 – and beyond. This entry was posted in Blog and tagged Cobra Sport, Exhaust, Milltek, Scorpion.